Welsh boxer Enzo Maccarinelli says he will have no fear when facing Roy Jones Jr in a non-title cruiserweight fight in Moscow on Saturday. 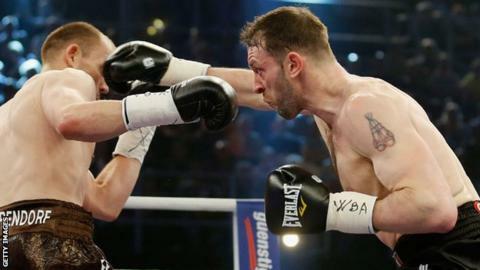 Maccarinelli will fight 46-year-old Jones, a former four-weight world champion, over 12 rounds. The 35-year-old weighed in at 13st 11lbs with American Jones at 14st 1lb. "He's not as fast as he was, he's not as good as he was, but he's still got a lot left," said Maccarinelli, a former WBO cruiserweight world champion. "If he was still at the peak of his career I wouldn't be sitting here talking to you thinking I could win." Jones has won eight fights in a row, with his last defeat coming against Russian Denis Lebedev in 2011. "He was an amazing fighter and at one point he could probably have gone down as the greatest of all time," Maccarinelli added. "But I won't be in awe of him. They call him superman and superstar, but to me he's just plain old Roy." The bout, which takes place at the at the VTB Ice Palace, was originally billed as a WBA cruiserweight title fight. But the governing body's vice president Gilberto Mendoza said no title would be at stake. Neither fighter was included in the WBA's latest cruiserweight rankings released in November, and Maccarinelli says he is not disappointed there is no title at stake. "When I accepted the fight I didn't know it was for anything anyway," he said. "But it didn't really bother me in the slightest. People know the sort of person I am. "I don't think I would have classed myself as a world champion anyway if there was anything on the line." In 2003, American Jones became the first former middleweight to win a heavyweight world title for 106 years. But he has not held a world title since 2004, when he lost his light-heavyweight title to compatriot Antonio Tarver. Maccarinelli, meanwhile, has not been a world champion since losing his WBO cruiserweight title to David Haye in 2008. He has competed at light-heavyweight in recent years but has moved back up a weight after losing to WBA light-heavyweight champion Juergen Braehmer last year. Jones officially became a Russian citizen after he was presented with his Russian passport in Moscow in October. Russian president Vladimir Putin signed a decree to grant citizenship to Jones in September after meeting the boxer in Crimea in August. Former super middleweight world champion Carl Froch has said both fighters are risking their health and Jones Jr in particular is putting his legacy on the line. "He should not be fighting - he should be sitting at home with his feet up watching fighting," Froch said. "By fighting on and on you are risking your legacy and your career. "But more so than that, you are risking your health. "I don't like to see it, it's a shame."